Thread: Why a turret press? The basic reason for me is volume. I put 2 to 4 thousand pistol rounds through the same gun per month for action pistol, where Bullseye level of accuracy is not needed as much as reliable function. 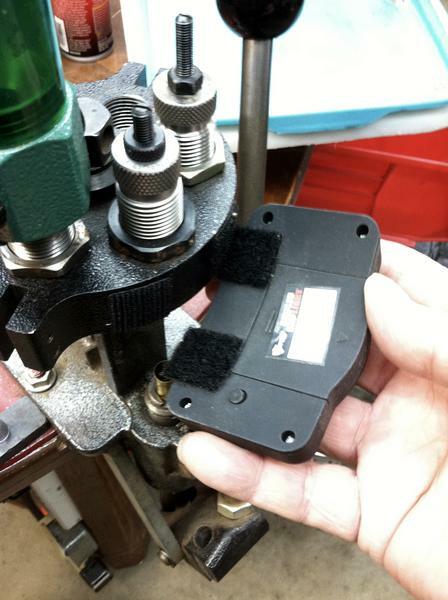 I leave the dies in the tool head, which holds the settings to produce the round specifications I want. If I change calibers, the settings for the new cartridge are already there in the new tool head that I swap into the press. Even with the basic Dillon auto indexing progressive that I use (SDB), I can regularly produce over 500 rounds an hour of practice ammo and 400 rounds an hour of match ammo. I'm pretty sure that I wouldn't produce that much with a single stage or a manual turret, and I'm not willing to sacrifice the volume for what is for me a small and unneeded increase in ammo accuracy. Now I might consider a Dillon 550, which is not auto indexing, but just so I can load rifle (.223 in volume) and perhaps a single stage for accuracy rifle. Edited because, like a newb, I didn't read the whole thread and was adding to drift and tried to make my post a bit closer to the OP's question. Last edited by kevin c; 02-07-2019 at 05:55 PM. Might have to get one .I don't think I'll be much quicker though .I tend to size cases one day ,trim another ,flare and hand prime ,then load em on separate days ,like to have my cases primed /flared ready to load when the mood takes me . So you have the powder measure and all the dies mounted in the turret and twist the turret for each stroke of the lever? Swapping the turrets makes a great deal of sense, since this is what I do with my DL-366 shotshell loader. Also I can see a bit of an advantage when working up test loads in not having to change dies, although the HOR L-N-L makes even that quite quick, but when running a couple hundred cases of a specific, known load, I don't see much gain. All my rifle loading is done on an old Schissel H-press, although I do have a CH CHampion and an RCBS RockChucker for things that are difficult to do in the H-type press, and my handgun loading is with HOR Projectors, each of which is dedicated to a specific handgun and load. I have 7 of them and 3 more waiting for a new centerfire handgun. Yes, these are the old Projectors which I prefer to the newer L-N-L progressive. So you have 10 ProJectors. Now I don't feel so bad about keeping my old one, instead of trading up. As discussed, Turrets can be used batch style or for individual loading. Lees kind of blur the line with Progressives. Another option is a row of single stage presses. I have 4 SS presses and do things assembly-line style, one at a time. Usually. If I have a few pieces of brass that need primer pocket swaging or some other process, I'll do them batch on one press and still have my crucial bullet seating and sizing dies untouched and left alone, still adjusted. I did time the difference. I did 100 rounds of 38 special using the turret as a single stage. It took 1 hour. I did this over three days and it always took an hour. I began using the press as semi-progressive and did 100 rounds in 40 minutes. Again, I did this over three days and it was consistent. When I run the Lee Classic Cast turret as a single stage press, it takes an hour to do 100 rounds. When I use it as a semi-progressive, I get 150 rounds per hour. Needless to say, I run it as semi-progressive as much as I can. I only run it as a single stage when doing rifle cases larger than 223. This still is not as fast as a Dillon but I don't need that much capacity. 100% correct, I have 3 Reddings and 7 turrets. Setting up a die correctly involves more than just screwing it in. Once done right, I'm done. I couldnt keep up with how much i was shooting with a single stage. My turret press has made a huge difference of how much i can reload. Even without having all the extras it is a dramatic increase. Yes I do...When I deliver a powder charge to a case I leave the throw in the 'delivered' position and the next throw I reach up and 'take' a new charge and this way powder does not settle in the metering hole causing varing charges. Vibration from the shuffling of the turret does settle the powder in the hopper but that is a good thing. 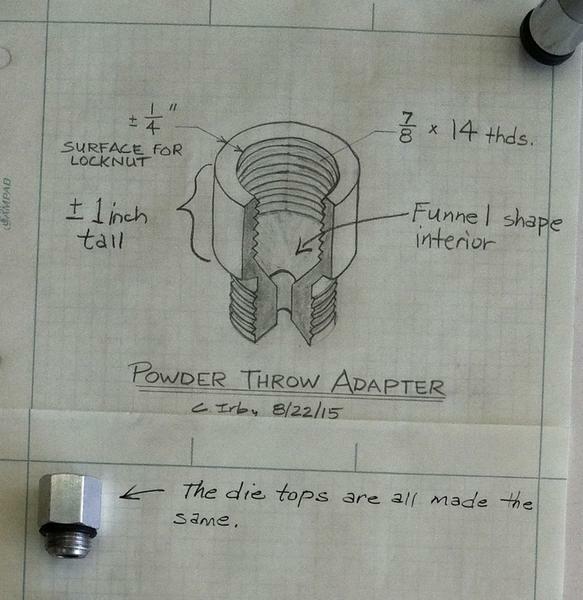 A friend in Texas made that adapter for the top of the Lee powder through the expander die and I can use any of my powder dispensers I want depending on the powder and charge, the dispenser is easy to remove without disturbing other dies adjacent to it. Last edited by OS OK; 02-08-2019 at 10:21 AM. Two schools of thought going on here. Move the tool to the work or the work to the tool. Drill press vs hand drill. Both can work but... The advantage of a turret press imo is the ability to start with an mty fired case and end with a finished round but more importantly, you can make 20 minutes worth of ammo or an hours worth, however much time that you want or have available to invest for that session. You still might have a ammo can of mty brass to go but you’ll have a ammo can of finished loads with nothing in between to keep up with. I’ve got 2 Dillon 550s [pistol and 300BO] and 2 lyman T2s [for pistol calibers] but there are 2 single stage presses too [for rifle calibers]. Another thing that I’ve done is mount a Dillon 550 measure on both my T2s to speed things up even more, just work the ram and charge your case. Work smarter not harder. Last edited by Baltimoreed; 02-08-2019 at 10:31 AM. I've used many presses in the last fifty+ years that include single stage, turret, and progressives. They all have their place as everyone's "needs" are different. I still use a '60s Texan turret for all handgun cartridge handloading. They're somewhat faster than a single stage, but still allow the operator to visually observe every step of the process with a close inspection. For load experimentation, something I assume many handloaders still do in search of the best load, a turret press is very adaptable. This can also be done with a progressive machine, but not with the same flexibility and ease. A turret press is versatile. The convenience of die set-up is why I have used the LEE turrets since they came out. I now have a the Lee Cast 4-hole turret and swapped the the turret head on a new Lee four-hole cast turret for the three-hole to use all the 3-die turrets I have set-up. I use the turrets much like the 'newer' breech-lock die holders. It is easy to back-up or load a small number of cartridges without spinning dies. Die adjustment also seems to repeat better than using the lock-rings with set-screws. The Redding T-7 and other similar turrets have never appealed due to loading more than one or two calibers. I have seldom used the turret press in the manner of turning the turret for all operations on a single cartridge. I use my turrent for decapping and sizing. When I've shot enough to reload, I run them in the walnut to clean them up for sizing. then I will decap and size. Then back in the corn to finish polishing and clean the sizing lube off. After that I get out the auto index and load them up so that I am ready to shoot some more. I have my turrent filled with all my sizing dies that I load for. Can't buy another cal of gun because I don't have any more room in the turrent unless I take out the universal decapper or pick up another turrent press. & I currently am unable to afford, nor shoot enough to warrant getting a progressive. So, the turrets(I have 3) do what I need as far as production, and were affordable. That is the answer to, "Why a turret press? ", for me. A turret press may speed reloading handgun ammo using a carbide sizer a little. You still have to jack the handle for each and every stroke of each round. For reloading larger bottleneck rifle rounds, especially those that headspace on the shoulder I think the turret press may not be of much advantage. You need to lube the case and the inside of the neck and then insure you do not contaminate the powder with the lube. Rather than mess with that I just run my bottle necked cases in large batches. But then I NEVER load a batch from A to Z in one session. My DAD bought a Lyman SPAR-T turret press when they came out in the 1960's. Used for Handgun until he died in 1988. He keep .357mag & .45Colt in the turret most of the time, could reload a box of 50 shells in about 40 minutes, that included cleaning primer pockets & priming with a Lyman 310 priming chamber. The Co-ax gets you faster die changes with out buying any turrets, and is better built. My main reason for using a turret press, the Lee Classic Turret Press, is because I can set my dies and change calibers with a simple change of the turret. 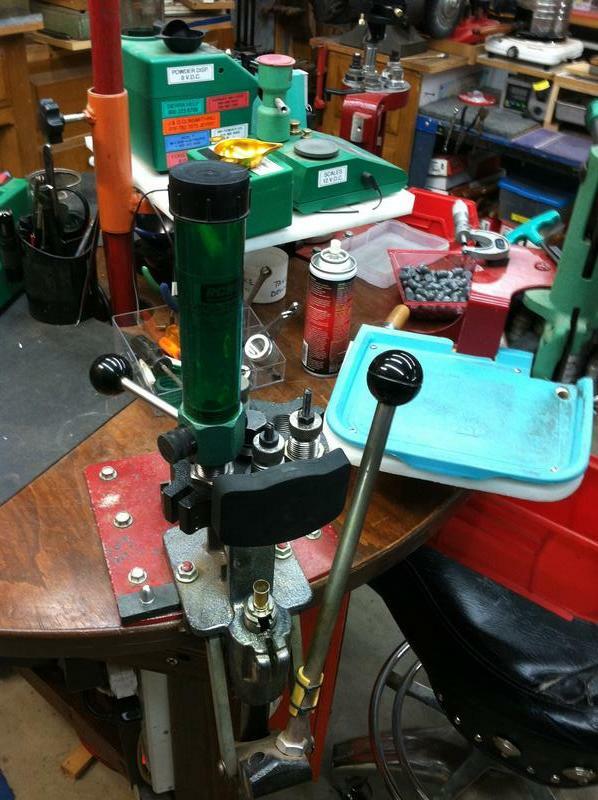 I still use it as a single stage because of how I process my brass and reload, but it is convenient to me to have the ability to resize my brass without having to mess with the dies as often. If you use the same bullet, even the seating die can be left as is, but will have to be adjusted if you change out. Batch loading on a turret, interesting concept. Silly as can be, though. Why even bother? A turret press will speed up manufacturing a single cartridge by threefold, because you are not handling the case, you are rotating in each step(die/station) from start to finish. That is why I can turn out 150 rounds on my lee classic turret over single stage loading 50 rounds, in the same amount of time, with the same margin of safety. Economy of motion is the term, as anyone with a clock can see, it is obvious. Current potus is the most inept to ever hold the office. It is a bullet, stop using a cartoon name for it. Because I got tired of changing dies in and out and back in. I am not the most organized sort and in the process of running through a certain cartridge I would find another batch of brass that I would have to run this die out and that back in just to bring them up to speed. So with that and the LCT on sale at that time for $74 I bought it. I still am a died in the wool single stager (a Redding Boss compound is center stage) but I have no plans on letting my turret go. Have a Hornady LNL progressive as “liberal insurance” as well. I do not use my LCT with the auto advance either because I am generally single staging with the periodic clicking back to catch up some cases on a prior step. Socialism works great until you run out of zoo animals to eat! Speed is not always everything. I keep the auto advance on my Lee turret off mostly, as I am constantly working on new loads . When I want to crank out "go bang " ammo, hook it back up and it will spit them out. I prefer it to the LNL Hornady, it is now a dedicated depriming press. Interesting die storage. Can you elaborate?